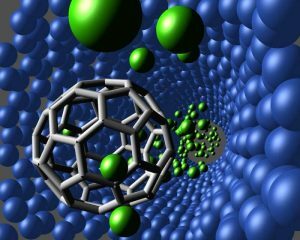 Nanotechnology may be able to create many new materials and devices with several applications in energy production, medicine, organic materials and electronics. Recently there has been many applications using nanotechnology also known as nanotech. Carbon nanotubes, graphene and their compounds presents electrical properties for organic materials, and electronic applications such as photovoltaics, sensors, semiconductor devices, displays, conductors, smart textiles and energy conversion devices (e.g., fuel cells, harvesters and batteries). Depending on their chemical structure, carbon nanotubes (CNTs) can be used as an alternative to organic or inorganic semiconductors as well as conductors. In addition to their high conductance, they can be transparent, flexible and even stretchable. Here, applications are for displays, replacing ITO; touch screens, photovoltaics and display bus bars and beyond. CNTs will be able to provide high performing devices which can ultimately be made in low cost manufacturing processes such as printing, over large areas. They have application to supercapacitors, which bridge the gap between batteries and capacitors, leveraging the energy density of batteries with the power density of capacitors and transistors. Graphene, a cheap organic material, is to be used in some applications as a significantly cheaper printed conductor compared to silver ink. Graphene and its compounds are increasingly used to make transistors that show extremely good performance. Nanofibers that could be used to manufacture clothing and textiles. Nanoparticles are used by U.S. researchers to ‘smell’ the scent of illnesses in fluids of the body. The researchers used nanoparticles of gold with different coatings to distinguish among different proteins and detect the illness, as reported by the New Scientist. The ‘nano nose’ uses a system of six receptors, each one consisting of a solution with gold nano particles not larger than 2 nanometers, each one having a different coating too. Nitrogen atoms form the organic molecules which make up the coating of the nanoparticles. A “nano-needle” with a tip about one-thousandth the size of a human hair, pokes a living cell causing it to quiver briefly. Once it is withdrawn from the cell, this ORNL nanosensor detects signs of early DNA damage that can lead to cancer.